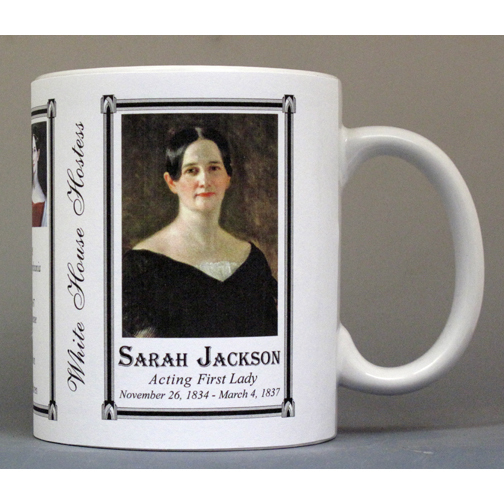 This Sarah Yorke Jackson mug is part of our First Lady biographical mug collection profiling the women who helped their husband, father, uncle or family friend while he served as president of the United States. 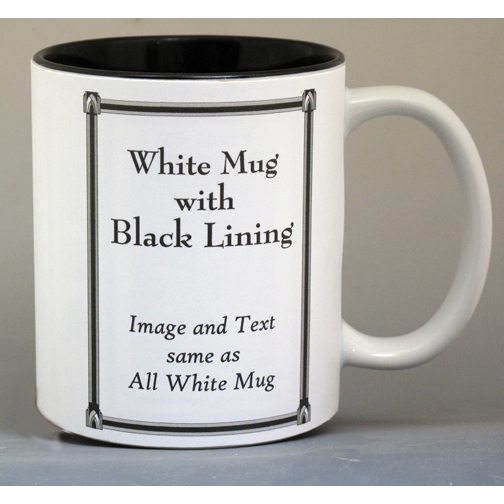 An image of Sarah Yorke Jackson and a short biography are features of this history mug. Sarah Yorke Jackson was the wife of Andrew Jackson Jr., who was the adopted son of Andrew Jackson. When fire destroyed the main house at the Hermitage in 1834, they moved into the White House. Sarah took on the role as co-hostess with Emily Donelson, who was Jackson’s niece and unofficial First Lady since the beginning of Jackson’s presidency. This was the first time in American history that there were two women acting as White House hostess. In 1836, Emily Donelson fell ill with tuberculosis and died. Sarah Yorke Jackson took on the role as unofficial First Lady for the remaining years of the Jackson presidency. 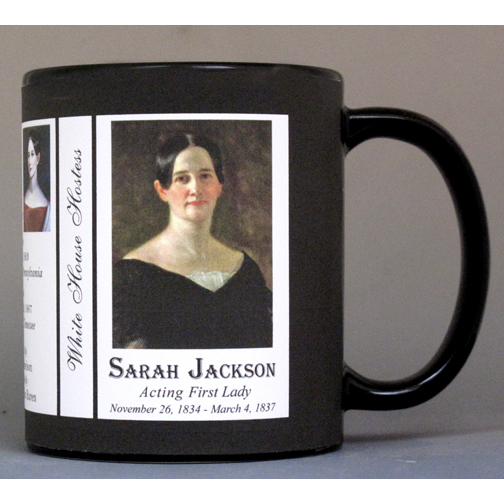 This Sarah Yorke Jackson mug is part of our history mug series profiling the women who helped their husband, father, uncle or family friend while he served as president of the United States. Most people assume that all US presidents were assisted in office by their spouse, but that was not always the case. Our series on the women who supported their husband, father, uncle, brother or family friend during his term as US president is filled with many unique individuals. Women who were not married to the president served in the position when the president was a bachelor or widower, or when the wife of the president was unable to perform in the role. The origin of the phrase First Lady may have developed informally out of cordiality. In the case of Martha Washington, she was referred to as Lady Washington during her lifetime, but that did not mean it was a chosen or official title. A newspaper article published in 1838 using the term first lady of the nation when discussing Mrs. Washington, and maybe the first published use of the term. Originally the women served as hostesses for the many official gatherings held at the White House. Over the years they have redefined their duties and activities. Edith Roosevelt was the first to hire her own social secretary, Eleanor Roosevelt was the first to have a personal secretary, and Jackie Kennedy decided a press secretary was needed to assist her in her role. Starting with Rosalynn Carter, there has been an Office of the First Lady of the United States which is made up of four divisions: press and research, social and personal, projects and community liaison, and schedule and advance. She was also the first to have a Chief of Staff. 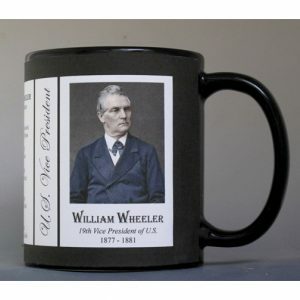 This U.S. Vice President William Wheeler History Mug is one of a complete collection of U.S. Presidential biographical mugs. 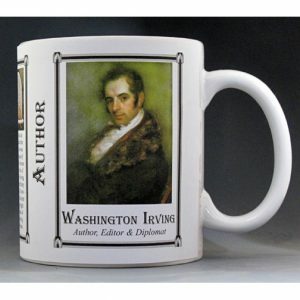 An image of William Wheeler and a short biography are features of this history mug. 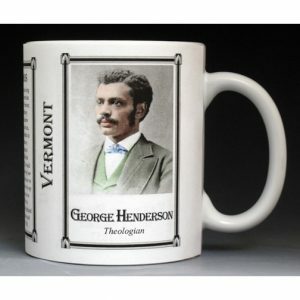 The George Washington Henderson mug is part of a biographical series profiling unique individuals who shaped the history of Vermont. 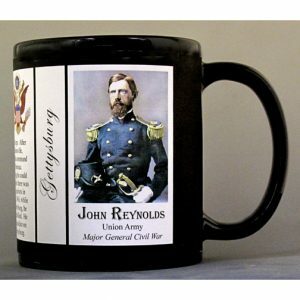 An image of George Washington Henderson and a short biography are features of this history mug.